Each new print copy of Essentials of Environmental Health, Third Edition also includes Navigate 2 Advantage Access that unlocks a complete eBook, Study Center, homework and Assessment Center, and a dashboard that reports actionable data. Experience Navigate 2 today at www.jblnavigate.com/2. 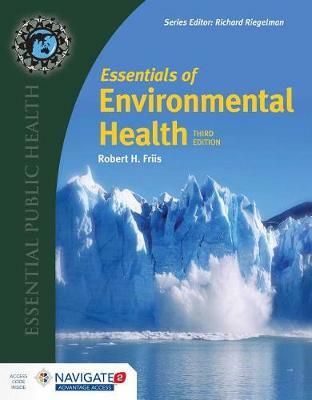 Essentials of Environmental Health is a clear and comprehensive study of the major topics of environmental health, including a background of the field and 'tools of the trade' (environmental epidemiology, environmental toxicology, and environmental policy and regulation); Environmental diseases (microbial agents, ionizing and non-ionizing radiation); and Applications and domains of environmental health (water and air quality, food safety, waste disposal, and occupational health). Using a straightforward, non-technical approach, the author has included many examples and illustrations of environmental health issues. Perfect for the beginning student as well as the experienced health professional, each chapter concludes with study questions and exercises to engage the reader in further study. The Third Edition maintains the structure of the previous edition with thoroughly updated examples, data, charts, tables and figures throughout. The most recent findings on the Ebola and Zika viruses have been added to the chapter on Zoonotic and vector-borne diseases. Additional study questions, exercises and ancillary materials have also been added.